Radar-based maps and migration forecasts could save birds from spinning turbine blades. With more than 50,000 wind turbines in place across the U.S., wind power now accounts for 8 percent of the nation's energy-generating capacity — and experts predict that figure could rise to 20 percent by 2030. But all that clean, renewable energy comes with a high cost to the nation's wildlife. 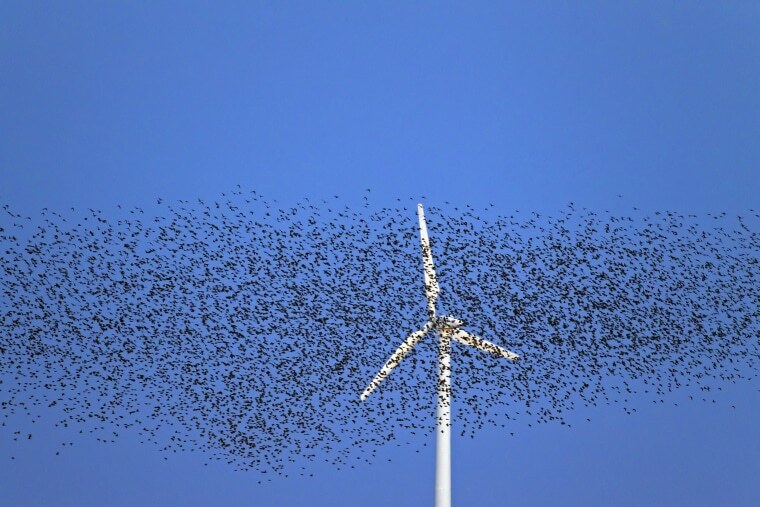 Researchers estimate that 140,000 to 328,000 birds are killed every year in collisions with the turbines' spinning rotor blades and support towers. The risk to birds is highest at night, when the blades and towers are cloaked in darkness. Now researchers at Cornell University in Ithaca, New York, have hit upon what could prove to be a simple way to protect birds from wind turbines. They've used the "signatures" of birds that are visible in raw weather radar data to generate bird maps and live migration forecasts designed to alert wind farm operators to the presence of birds at peak times. On any given night during the peak of the spring migration — from the end of April to the beginning of May — up to 520 million migrating birds are on the wing, says Dr. Kyle Horton of Cornell's famed ornithology lab and one of the researchers involved in the project. "Our measures are dominated by small songbirds, things like warblers and tanagers, thrushes and grosbeaks — those are the dominant signatures we're getting," says Horton. It's long been known that migrating birds are easily detected by the Doppler radar systems used to monitor rainfall in the U.S.
For weather forecasting purposes, of course, the radar signals caused by bird flocks are filtered out. But the Cornell researchers, including Horton and Benjamin Van Doren, a zoologist who recently moved to Oxford University in the U.K., realized that birds' nighttime flights could be used to generate real-time maps that could help save birds' lives. After working for several years to integrate the signals from a network of weather radar systems across the U.S., the scientists a few weeks ago started posting automated bird migration forecasts and real-time tracking maps at the lab's website, BirdCast.info. Van Doren and Horton hope wind farm operators will heed the forecasts and maps — which are drawn from 143 weather radar systems across the country — and stop or slow their wind turbines temporarily when large numbers of birds are flying through the area. One solution to the bird-strike problem might be to raise the turbines' so-called "cut-in speed." That's the wind speed above which it makes economic sense to run the turbines. Wind turbines operate more efficiently at the high wind speeds, Horton says, while birds tend to avoid flying on windy nights. "If we're getting large pulses of [migrating birds] coming through on a handful of nights, then altering their strategies for just, say, five nights versus doing nothing, then it may have a big impact," he says of wind farm operators. The bird migration maps could also make it possible to switch off some of the lights on tall buildings and communication towers at peak times. The lights on such structures are known to confuse birds flying at night, and result in many fatal collisions, according to Horton. Given the short period of time that the maps and forecasts have been online, it's too soon to tell whether they're having a beneficial impact. But the researchers are hoping for good results. Says Horton, "We really want to see some conservation come out of this, hopefully to reduce some of the mortality."